A new campaign featuring celebrities flicking the camera the middle finger has hit the Web to raise awareness of bullying. 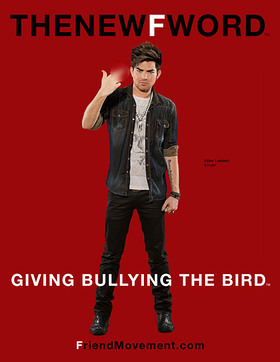 LeAnn Rimes, Adam Lambert, Lance Bass and Carmen Electra are among the stars giving the bird for the Friend Movement, an organization that was created to help show positive anti-bully images through art and media. The New F Word is a grass roots photo campaign and documentary film that aims to encourage the use of the word FRIEND to project inner strength and confidence. The concept by Elliot Dal Pra London & Ronnie Kroell was taken to a whole new level when Bianca Kosoy, famed branding creative genius, helped shape the campaign by giving it the edginess for which she is known. Add celebrity photographer and co-creator Ryan Forbes to the mix, and you have quite the creative team; bullying beware. From FriendMovement.com: "The meaning behind The New F Word photos refers to an individual’s awareness of how they feel. When a person is called a FREAK they shut down inside, letting the bullying continue. We want the individual to have an empowered inner monologue of “F U, I am actually really FABULOUS and do not need your approval”. This confidence helps to build meaningful friendships and curb the bullying. It’s important to remember that we teach others how to treat us. Our silence simply condones bad behavior, therefore it is no longer an option." 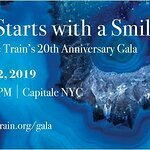 LeAnn Rimes is also set to headline an evening of celebrating music and friendship at El Rey Theatre, Los Angeles, with proceeds benefitting Friend Movement on July 1. The concert will also feature Dia Frampton, Frenchie Davis, Austin Brown and Abraham Lim. More info can be found here. Find out more about the New F Word campaign here.